Inciting Event: Hiccup finds in the forest the Night Fury he has knocked down, but is not able to kill him. Most important, he realizes he’ll never be able to kill a dragon. First Plot Point: Hiccup touches Toothless for the first time and their friendship begins. Hiccup decides he will secretly work to make Toothless fly again. First Pinch Point: Hiccup is forced by his father Stoick to attend the young Vikings training to slay dragons, which is exactly the last thing he wants to do at the moment. Midpoint: The first flight of Hiccup and Toothless together: they can fly only together as a whole. A big success for both. Second Pinch Point: Thanks to all the things he’s learning from Toothless, Hiccup is the best of his class and wins the “honor” to kill a dragon in front of the whole village. 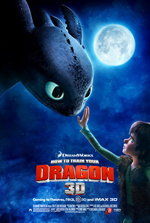 Third Plot Point: The truth blows up in the face of Hiccup: in the arena he refuses to kill a dragon, Toothless comes to save him and is thus discovered and captured. The lie is now out in front of everybody and Hiccup is disowned by Stoick. As Astrid says in the movie, he’s lost everything: his best friend, his father, his tribe. Climax: Hiccup makes a plan to free Toothless and save his tribe from the Queen Dragon. He teaches the other young Vikings to ride dragons and they leave Berk together to reach the battlefield. Climactic Moment: Riding Toothless, who has been freed by a very remorseful Stoick, Hiccup defeats the Queen Dragon at the risk of his own life. Big, heroic final battle. Resolution: The Queen Dragon is killed, the tribe is safe, Stoick recognizes the value of Hiccup, the Vikings learn that dragons are gentle and loyal creatures, Toothless and Hiccup live together happily ever. The Story Structure Database is an archive of books and movies, recording all their major plot points. Unsure of a structural point in a story? 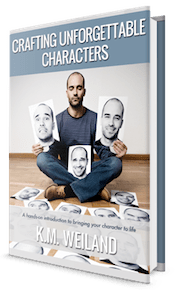 Want to browse examples of story structure? Search the database to find exactly what you’re looking for! Click here for more information on getting the most out of the database. Click here for a complete alphabetical list of all titles in the Story Structure Database. Hiccup, a hapless young Viking who aspires to hunt dragons, becomes the unlikely friend of a young dragon himself, and learns there may be more to the creatures than he assumed.